"Born to be a king, I ask one thing in return: a front seat to watch Earth burn." 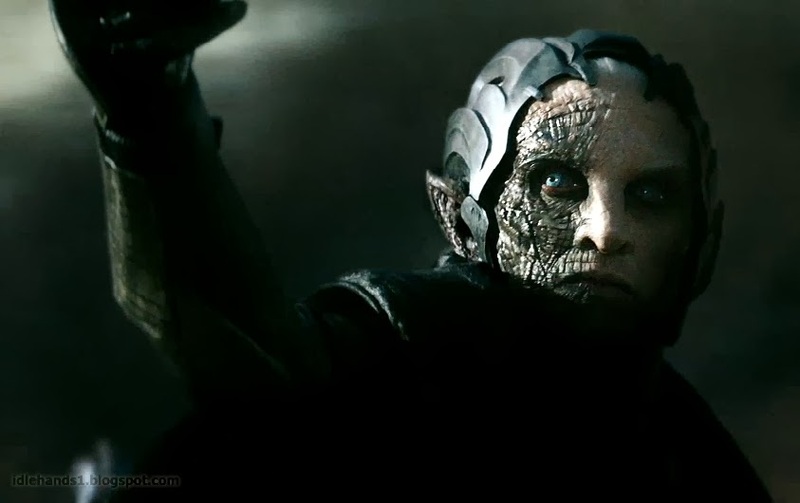 Malekith the Dark Elf is not to be messed with. 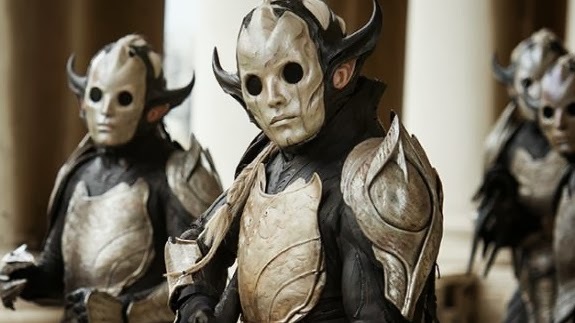 In his original war against Odin's father's Asgardian forces, Malekith was denied the powers of the Aether, which are only obtainable on the cosmic rarity that the nine realms are aligned. Venting his fury, he orders his forces to 'suicide bomb' those who denied his quest, except (in true military leadership style) those aboard his own ship. Having watched Thor: The Dark World, after a good nights sleep, I now realise that's that same logic the powers that be have applied to this film. There are moments of fantastic awesomeness that only a Thor film should carry, it's just too bad these are dive-bombed by scenes around them, that just don't have the same mythological profile. 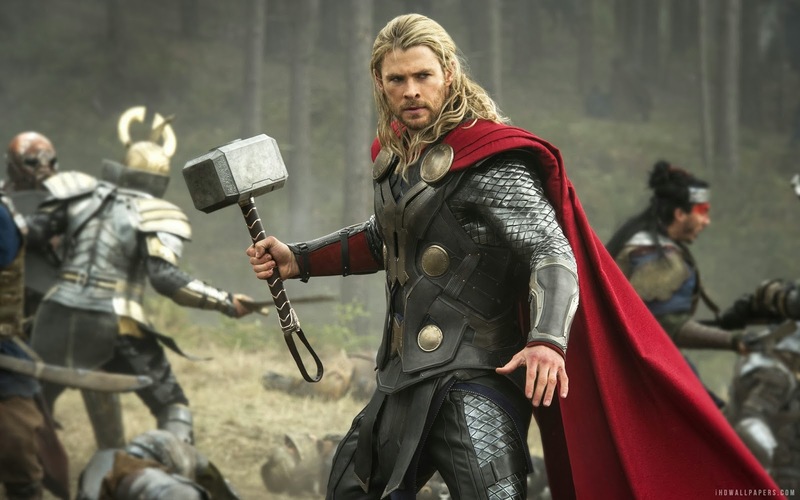 Thor: The Dark World truly is a tale of two worlds. 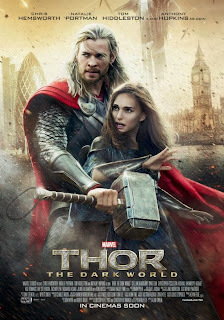 Jane Foster (Natalie Portman) is begrudgingly moving on with life. It's been two years since The Avengers saved New York, and no one has seen or heard of Thor (Chris Hemsworth), not even her. Drawn to London by her colleague Erik Selvig, who has since gone missing, Jane's mapping of mysterious phenomena soon makes her the most valuable player in Malekith's plans for retribution against Asgard, as the nine realms once again move to align. As Odin's (Anthony Hopkins) strategies start to rival his son's, Thor leads a rebellion in order to save his people, earth and the woman he loves. Only the key to the plan's success lies in a jail cell beneath his feet and though he calls him 'brother', is a dangerous one to trust. If only the movie itself had set things up as succinctly. The lengthy set up needs a stronger editor's rule. To my mind, Thor lends himself best to runaway train type action plots and scale, yet the first quarter feels like we're driving with the handbrake still on. It also shows the division of worlds in the film itself. On one hand, The Dark World wishes to be a more serious Asgardian adventure than its first installment, and rightly so. There's more of a focus on fantasy, Lady Sif (Jaimie Alexander) and the Warriors Three are less Masters of the Universe, more Lord of The Rings in their look and behaviour, yet an overdose of shoehorned comedy negates this work, sending the tone in mixed directions. That's not so say all the humour is bad. Thor's train and hammer hang are pure genius, as is Captain America's cameo, yet Stan Lee's is not so funny and neither are more of the romcom moments that the film constantly detours for. One of my main wishes for a Thor sequel, was that Heimdall (Idris Elba) got more to do, so it is ironic the slow-mo set-up gets cleared out and momentum increased, with the watcher of the rebuilt Bifrost Bridge single-handedly taking on the invading forces. Talk about epic. These are the scenes Thor excels in. These are the ones that match the franchise. As small as Thor leaping off a tower and catching Mjolnir mid-plummet as he shoots off to the palace, or as big as Odin's wife, Queen Frigga (Rene Russo) drawing swords against Malekith, these are scenes 'of which they will speak of long after' in true Norse style. Then of course, there's Loki (Tom Hiddleston). More so than Hopkins or Portman, the depth and nuances Hiddleston pours into this character not only give the film it's weight, it moves the film into a different class while he's on camera. When tragedy sees the two step-brothers shakily align, the movie is at a flawless high. 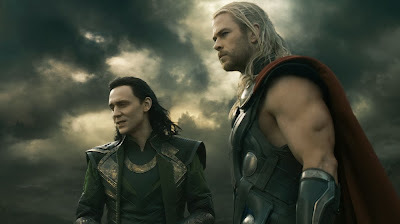 Infact after Thor and Loki go their separate ways, The Dark World never recaptures that interaction of character, chemistry and action, even as stakes go higher and the conclusion nears. Of course you can't have alien invasions without special effects and this team delivers in spades. Asgard looks even more majestic, and although the elf soldiers have Teletubby faces, the plentiful spaceships create a perfect rainbow bridge between Midgard sensibilities and a cosmos ripe for upcoming Marvel film, The Guardians of The Galaxy. However, too much time in set-up leaves little time for resolution. The love triangle between Sif, Jane and Thor doesn't get expanded upon in the final moments, yet is prominent in the early stages, and we don't see any repercussions for Thor's renegade allies, until two of them appear 'back on duty' in one of the two post-credit scenes. Yet it is the relationship the actual closing scene shares with these two 'extras' that best illustrates the schizophrenia of this film. The post typeset credits scene should've been left on the cutting room floor. The post illustrated credits scene births a character played by Benicio Del Toro, that ties directly to The Guardians. (It's a role I always pictured David Bowie in and I think from his manner, Del Toro does too). Then finally, yet ironically first, the actual closing scene of the movie itself, is astounding. It makes you want the next installment right now - yet on the strengths and weaknesses of this film, sadly I'm not sure if that should be in a Thor 3 but rather a Loki 1. Hope I didn't spoiled too much. Thanks Aliera, glad you liked the review! If I collect anything as much as I do comics its English comedy, from Dads Army and Open All Hours, right through to Ab Fab and Mrs Brown, I'm a sucker for the lot, so its always good to find another fan. Like I say some humour in TTDW is great but much is well... yeah. I don't think you spoiled anything either but not letting something slip can be tricky. One thing I did forget to give props to was the farewell ceremony with the boats at night. That scene was truly breathtaking. Good review Dan. Cool to see Thor get another movie that fully-fleshes him out, without making him seem like nothing other than just a total meat-head. With a hammer, of course. Thanks Dan.O! Glad you liked the review - yeah it is good they flesh out the Asgardians in ways other than having Thor get half naked each time. Thanks for stopping by and commenting!